If you need more information than can be found here, please don't hesitate to contact us, either by filling in the form on the contact page, or by e-mail to one of the committee. Just click on the name on the committee page. The latest news is to be found below. If you would like to be added to the list of people who also receive this information by e-mail - or if you wish to be removed from the list - please contact the webmaster. Members of the ZSCDC are automatically included on this list, unless thay have specifically asked to have themselves removed. 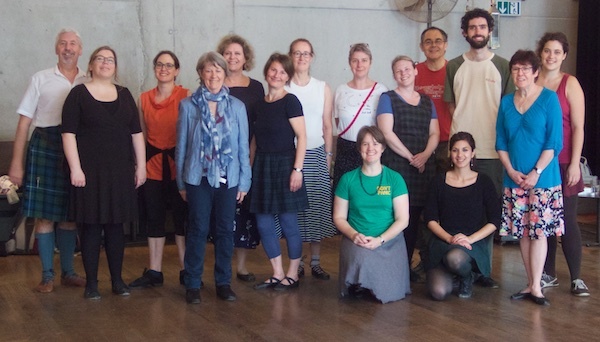 15.04.2019: On Saturday, 13th April we had a workshop in the Gundeldingerfeld Tango studio in Basel. Morven Rüesch and Chris Harris taught the classes and Sue Bollans from Munich was our musician at the piano. The workshop was successful, and everyone seems to have enjoyed themselves. And looking further ahead, We'll be hosting our biennial St Andrew's Night Ball and Dance Weekend in the Hotel Geroldswil on the 30th November - 1st December. For full details, click the November 2019 tab.